In the space that was once upon a time Sushi Yasu is now Sushi Akio. It looks the same on the outside, it looks the same on the inside, and, just like Yasu was before it moved to Austin Street, it's BYOB. Plus it's cheap, just like Yasu was. In fact, if no one told me, I'd just assume they were the same place. Sushi Yasu had fantastic sushi served in an intimate, albeit low-rent setting out on the edge of the neighborhood. This distance from the beaten path added to the relaxing nature of the place and it adds to Akio's. 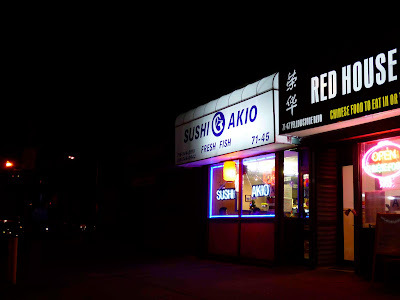 Since most people who travel to Forest Hills prefer to eat at Friday's, Aged, Corfu or any of the other restaurants on the Austin street strip, there was always a sense (false though it might have been) that the Yasu crowd were from the neighborhood. It's not that the tables all talked with each other or started singing the sushi version of drinking songs, but this illusion of eating at a community place seemed to make the Yasu feel more homey. 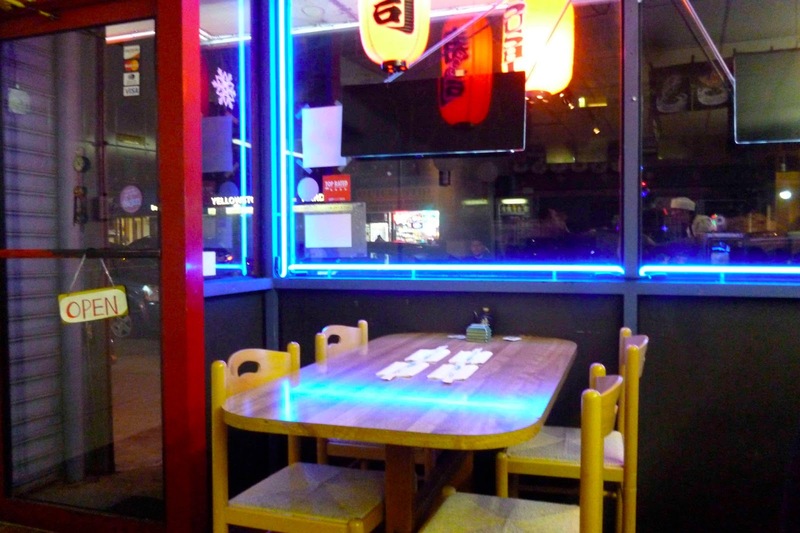 When Yasu moved to Austin Street, it lost that and became more conventional. 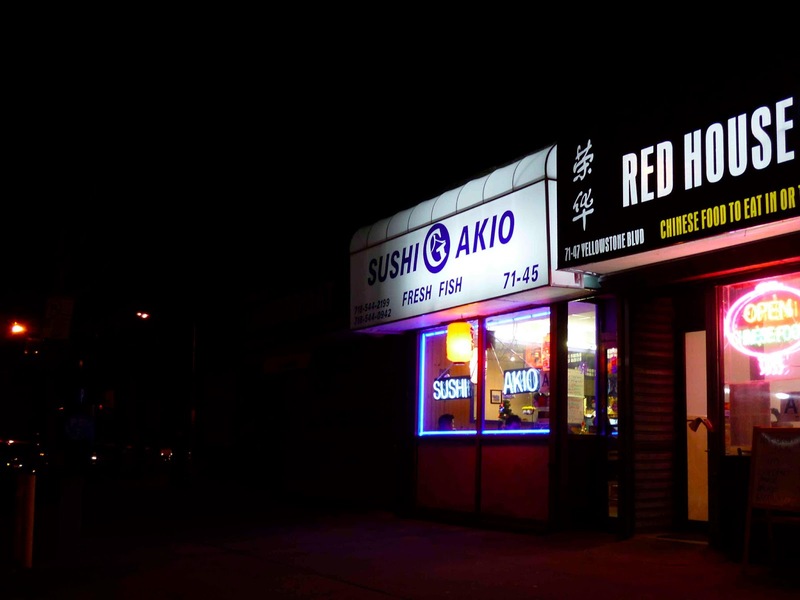 So it's nice to see that Sushi Akio has taken on its mantle. For a starter, I had to have a cup of Miso Soup. This particular night was one of the cold ones and a piping hot miso soup, along with a few pots of piping hot green tea, makes a world of difference. It didn't hurt that the soup was damn good. Sometimes you get very thin or very salty miso, but that wasn't so here. Bro tried the Gyoza, a deep fried pork dumpling. It's a standard Japanese restaurant appetizer and Akio did a good job here. 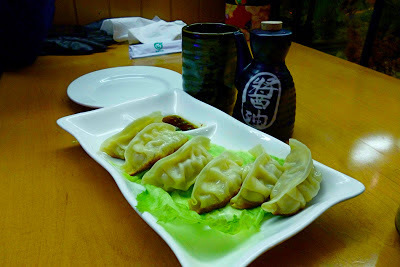 The dumpling shell was thin, making the dish an overall light one, rather than dough heavy, and the pork was fantastic. It just about exploded with flavor. I also tried the Spicy Kani, a seaweed wrap with crab, eel, and spicy mayo. This was delicious, though I think that just about anything with eel tastes good. Hardly spicy though. Bro and I split three large rolls. Each was very good and very heavy. Usually, the nice thing about sushi is that you don't fill yourself to bursting. You feel sated and not guilty. But these were big. I'll describe them in a bit, but first, a quick price rundown. As I said, Akio isn't expensive. It's sushi, so it's not free, but relative to say Narita, you could easily be paying more. The a la carte pieces go for about $3 each and the small rolls go for about $5. The larger rolls like you see above will range between to $10 and $13 each. The Little Delicious Roll (closest) was the first we agreed on: spicy tuna, crab, cucumber, avocado, and cream cheese, deep fried. 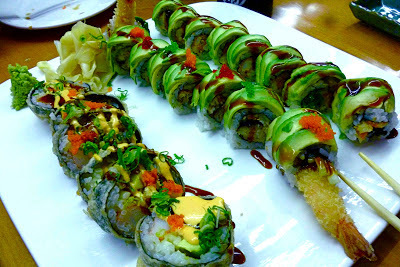 It was the holiday season so we also had to try the Christmas Roll: shrimp tempura, eel, cucmber, tobiko, and avocado. 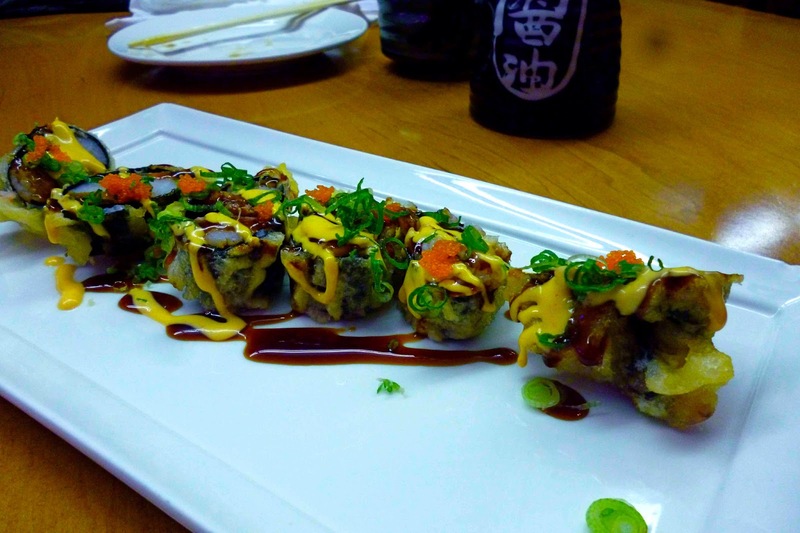 And finally, the Forest Hill Roll, because you have to: spicy shrimp, seaweed salad, and avocado with eel sauce. I liked all of them, but an excessive dependence on avocado makes them a little too similar. Next time, I'll have to be more cognizant of that. But I will absolutely return. 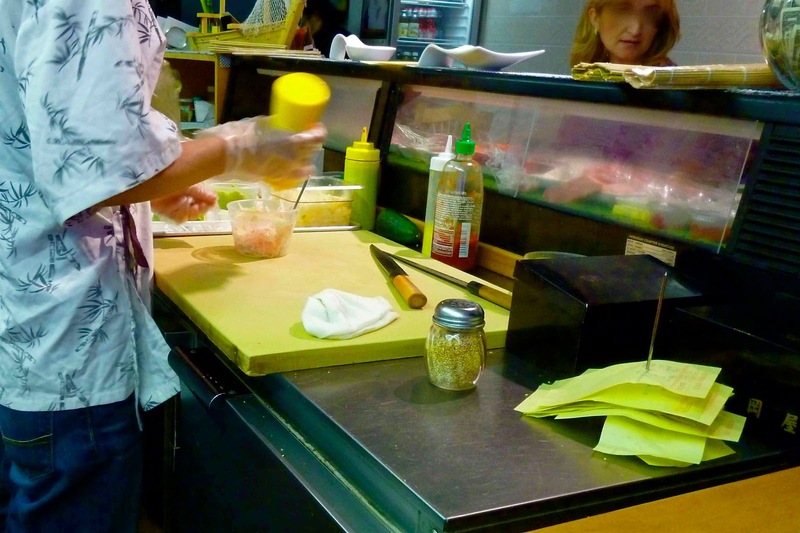 If your idea of getting sushi involves hitting up a local liquor store for a bottle of wine or sake, and then moseying up to the counter to watch the chef do his thing, in a relatively quiet (without being desolate) setting, then I recommend Sushi Akio. Our meal of tea, soup, apps and three large rolls came to about $70 with tax and tip.